Panduit, a leading manufacturer of data center equipment, has launched a new product this year to meet the demands of high performance data centers. The new HD Fiber Flex Cabling System was designed to allow companies to easily scale up density and execute changes quickly without upsetting other circuits. With the ever changing and advancing technology, it is important to have a system in place that allows your business to make changes and grow. This new Panduit product features a cable management layout that separates trunk cables away from the rear of the rack so that there is easier access for moves, additions, or changes. Cables are easily accessed from the left and right side of the unit providing greater access to installed connectors and cassettes. It also features internal split trays as well as the option to install cassettes from the front or the back of the enclosure. The split tray spans half the width of the enclosure and is much easier to move in an out than a fully populated tray that spans the whole width. This also allows easy access so you can service the network without disturbing the patch cables. Panduit has designed a high quality cable management system that allows for a simple migration from 10G to 40G/100G Ethernet data speeds. If space constraints are a concern for you, this new product from Panduit will really help you get more out of your IT space while keeping your equipment footprint small. The HD Flex Fiber Cabling system is built with reducing cost per square foot in mind and maximizes your network ability. Overall, this product will help your network do more, in less space, and gives you room to grow. 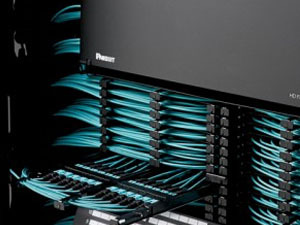 If you are interested in the new Panduit HD Flex Fiber Cabling System or would like to learn more about other cable management options, call us at 877-841-9240, or contact us online for a 100% free, no obligations quote. 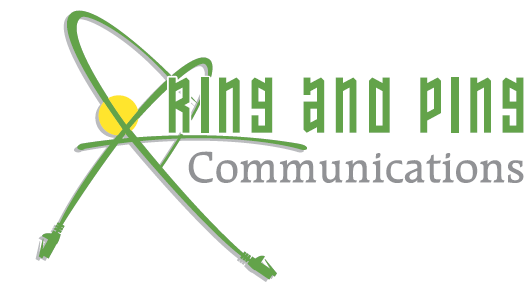 Ring and Ping Communications has been Southern California’s leading expert in network cabling and business communications for businesses both big and small for the last 12 years and we look forward to helping you with your network cabling needs.